This week's doorway features a close up of the door knocker. It was the best feature of the doorway and I found it quite striking (no pun intended) along with the color of the door. That muted colour seems so typically 'new england' on the old houses. My Wednesdays are always happy all because this theme, I love doors' pictures, and in your blog I enjoy the beautiful shots! I agree! Simple, but strong. I find both the color and design , elegant! The top bit looks like a moustache! 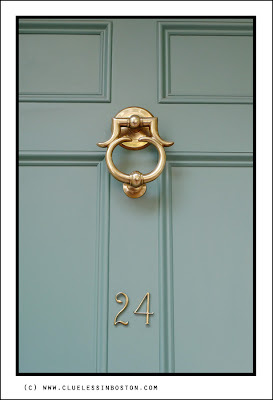 Lovely knocker! Doors are favorite objects to photograph. This one is delightfully symmetrical and lovely in its simplicity. In a quest for the perfect door this would be really close!